For academics and average workers alike, the prospect of automation provokes concern and controversy. As the American workplace continues to mechanize, some experts see harsh implications for employment, including the loss of 73 million jobs by 2030. Others maintain more optimism about the fate of the global economy, contending technological advances could grow worldwide GDP by more than $1.1 trillion in the next 10 to 15 years. Whatever we make of these predictions, there’s no question automation will shape the economic future of the nation – and the world. But while these fiscal considerations are important, automation may positively affect an even more essential concern: human life. Every day, thousands of Americans risk injury or death simply by going to work in dangerous conditions. If robots replaced them, could hundreds of lives be saved in the years to come? In this project, we studied how many fatal injuries could be averted if dangerous occupations were automated. To do so, we analyzed which fields are most deadly and the likelihood of their automation according to expert predictions. To see how automation could save Americans’ lives, keep reading. Many of the country’s most precarious fields seem quite likely to change due to automation. Motor vehicle operators, for example, accounted for more than 1,000 deadly accidents, and that occupation had a 74 percent likelihood of automation as the age of driverless cars approaches. Similarly, the construction trades witnessed 736 deaths and faced a 77 percent probability of mechanization. Some have called the industry ripe for a robotic takeover, as many construction jobs have actually gone unfilled in recent years. The occupations with the highest likelihood of automation, however, were substantially less dangerous. Retail sales positions, with a 93 percent likelihood of automation, saw relatively few workplace deaths. Grounds maintenance workers sustained slightly more fatal accidents (217) but had a 90 percent probability of being affected by robotic advances. Similarly, fishing and hunting professionals had an 80 percent likelihood of being automated, but this change would likely spare a relatively small number of lives. Just 26 fatal accidents occurred in this industry, according to our data. In the interactive above, a general trend emerges: Among the fields analyzed specifically, those that had an above-average rate of injury also tended to possess a higher likelihood of automation. Installation, maintenance, and repair occupations exemplified this dynamic, with 470 fatal workplace injuries and a 67 percent automation probability. Interestingly, public support for automation of dangerous jobs is relatively strong. One recent poll found 85 percent of Americans favor or strongly favor the mechanization of risky positions. Automation probability and projected workforce growth figures seemed contradictory in many cases. That’s likely because the BLS bases its projections on historical staffing data, so its figures are poorly suited to anticipate disruption ahead. Tax preparers, for example, were virtually certain to experience the effects of automation according to our data, but the BLS projects the number of Americans in that occupation will increase about 11 percent by 2026. For some professions, however, automation projections and workforce growth projections were equally grim. Data entry keyers faced a high likelihood of automation prospects, and those jobs were projected to contract more than 20 percent by the BLS. If automation promises to alleviate workers of risky responsibilities, the rate at which change takes place will dictate how many lives can be saved in the near future. If we first consider a conservative estimate of .4 percent workforce automation, the life-saving potential of such change is relatively limited. Certainly, preventing 183 fatal accidents by 2030 would be meaningful for individuals and families spared from tragedy. But with more than 99 people dying at work each week according to the latest federal numbers, that change would not significantly improve fatal accident rates nationwide. Moderate and rapid automation projections yielded much more appealing figures. If workforce mechanization proceeded at a rate of 3 percent, for instance, 739 American lives could be saved by 2030. A 14 percent automation projection corresponded to even more impressive results, with 3,450 workers saved by that year. Of course, these figures don’t include lives that might be saved by artificial intelligence in other contexts, such as patients who could benefit from automated medical procedures. 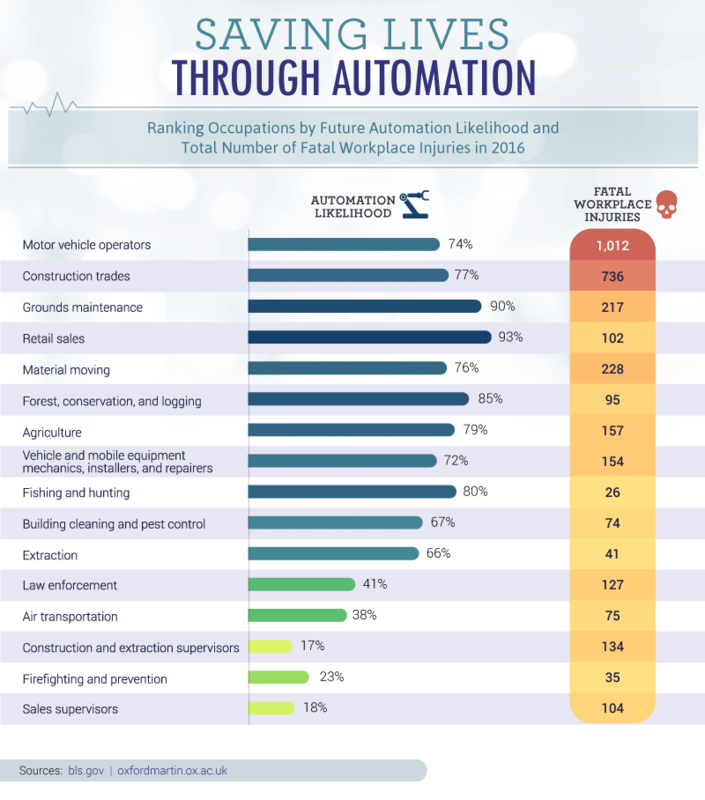 If America’s most dangerous jobs were all automated, what might we accomplish regarding preventing death? 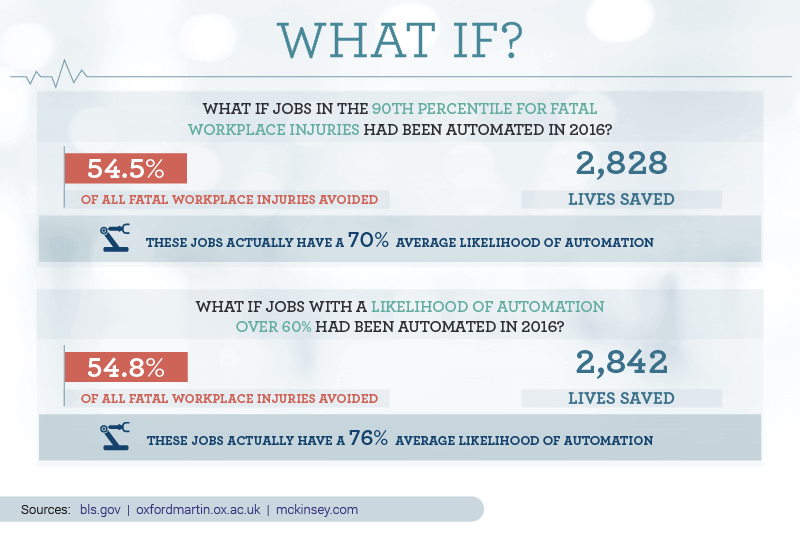 According to our figures, 2,828 lives could be saved annually if we automated all positions in the 90th percentile or higher for workplace deaths. That segment of jobs accounts for more than half of all workplace injuries nationwide, so the incentive for automation is certainly significant. Many of these professions seem likely to undergo mechanization anyway, with an average automation likelihood of 70 percent. But even if automation isn’t concentrated in the most dangerous industries, it may still save hundreds of lives in time. If we assume that all professions with a likelihood of automation of 60 percent or greater do, in fact, undergo robotic replacement, 2,842 lives could be spared each year. Of course, these figures also do not include other ways in which injury or death might be prevented by reducing human error through automation, such as crashes averted by driverless cars. When we consider automation’s benefits and challenges, we find important priorities for the American worker in conflict. Does the future entail a choice between job opportunity and safety? Should we adapt in the name of reducing risk or protect professions that currently employ thousands? These questions entail endless complexity and ethical uncertainty, but the future demands we engage them. Automation is coming, and workers and businesses alike must wrestle with the difficult choices it brings. One principle is not in question, however: Workers deserve the safest conditions possible, and employers should not endanger them in pursuit of profit. If you or someone you love has been hurt at work, we’ll help you seek solutions. You’re entitled to a safe work environment – and justice when your employer fails to provide one. We compared job automation estimates from the University of Oxford to data from the U.S. Bureau of Labor Statistics (BLS) for fatal workplace injuries. 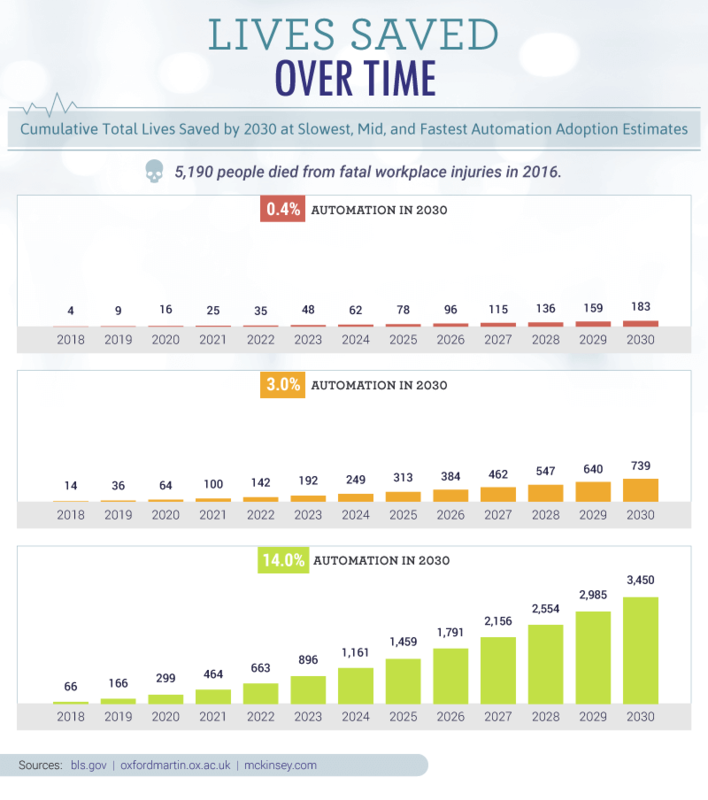 Estimated fatal injuries in 2026 were calculated using employment projections released by the BLS and the number of fatal injuries in 2016 reported by the BLS. Lives saved over time are an estimate using the percentage of workers that would need to change occupation by 2030 provided by McKinsey & Company. Estimates are a rolling total and assume the adoption rate grows at the same rate every year. The numbers represented in this project are purely hypothetical and not meant to serve as an actual estimate or projection for automation or fatal workplace injuries. Feel free to use out content and graphics for noncommercial purposes. We simply ask that you attribute us for our work by providing a link back to this page. Unlike robots, we humans appreciate getting credit sometimes.